A while back I wrote about my studioffice work-table and told you that I was going to be changing a few things – that a Part 2 post would follow. It took some time and I finally got it done! I re-purposed two cabinets that were hand me downs, a Luan door that I covered with black vinyl and ribbon and nail head trim for the work top. The two cabinets used as the base of my work table were stained in an “oak”y color that I was not fond of. I decided to paint them and add baseboard with bead trim molding along the bottom so the base would look a bit more modern. You can see things were a bit messy while I was busy transforming. I love the white and the solid base – now nothing can roll under the table, including dust bunnies. ***To see more details of how the table was made there is a link at the end of this post. My studioffice is set up in the room that the builder designated as the formal living room in our house plan. Since we have a family room, I decided that this space would better serve as an office and craft room. A place where I could create, gift-wrap, sew, and just get inspired. Since it is in the main part of the house – to the left of our foyer, it is in full view- which has a down side. If I make a mess – everyone sees it. I can’t close it off. The best part of this room is that it is sunny, bright, and cheery, and I feel part of the household, not stuck in the basement as I was in a previous house. What really made this a great place to create was after my hubby installed an electrical outlet on the floor. It is under the work-table. This way I can plug in my hot glue gun, Dremel drill, lights, etc. I have a stool behind the table that I sit on. I also use it when I am at my sewing machine. My sewing machine is in a corner. I have a round plywood table-top with glass and a tablecloth that I bought at Linens and Things. I use it to cover my sewing machine when not in use. I store my tool box and and a few other things under the table. I have a small bookcase in the front of the room where I store all my paper products and stationery. I recently painted it white to match the work-table. and added baseboard molding and beaded trim to the bottom. I like the modern look of the solid base. I simply cut the baseboard molding and nailed it over the existing base. I counter-sank the nails and Spackled the holes before I painted. My craft supplies are in the armoire. This armoire was a hand me down from my in-laws and has gone through many changes- pantry, clothes closet, and now a craft closet. I try to keep it organized so that I can just reach in and find what I need without having to rummage through everything. The rolls of ribbon are on tension rods that I fit to the inside width of the armoire. The desk is a partners desk that my hubby helped me make. We used an old wood file cabinet that was another hand-me down as it’s base. The inspiration board on the wall was created using 8 panels of foam board that I bought at the dollar store. I covered each panel with fabric and used mailing tape to attach the fabric to the back . I summer-ized my lamps by changing out the shades to white from the black I like to use in the winter months. I am also in the process of making a summer blue chair cover. You can see it in it’s unfinished state on the chair. Its going right over my black and white check cover. When Autumn arrives, I can simply remove it. I also placed a large framed mirror on the wall next to the inspiration board. This is directly across from one of the windows and reflects more light into the room – which I love, lots and lots of sunlight. Foam Board and pins from the dollar store that I used to make the inspiration board. You can use mailing tape or duct tape to attach the fabric to the foam board. I used the beaded straight pins to attach the boards to the wall. They are very sharp and were easy to press into the foam board and sheet rock. If you have trouble, use something hard and flat to press them in. 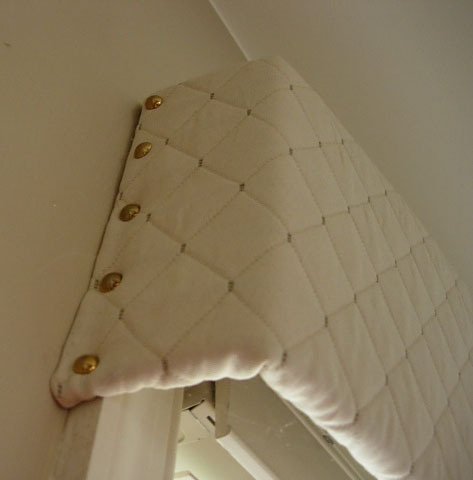 Using straight pins in this way won’t leave noticeable holes in the wall. I used solid color fabric to match the wall. I like when my stuff, junk, decorative items are the source of the color in my rooms – not large pieces of fabric or paint. Update: I recently did a bit of de-cluttering. I needed some breathing room. I made a cart out of a cabinet without a door that I found in a neighbor’s trash. I added wheels so I could move it around the room. My dad made the Lazy Susan colored pencil organizer for me. I found directions for it in an Artist’s publication about 10 years ago. I think it was a North Light publication. There is a row for each color family with the name of the color written on the each side. Keeps me very organized. Trax, the cat knocked the whole thing down a while ago. That was NOT fun having to put them all back into the drilled holes. Here is a link to the post I wrote about the Lazy Susan Colored Pencil Organizer. It makes the perfect place to set up a buffet when we entertain. Guests can mingle in here as well as in the family room, kitchen, and dining room. It keeps the party atmosphere spread throughout the first floor of the house. I hope you enjoyed seeing where I create. I will leave you with this pearl of wisdom. What a beautiful office you have! The desk looks brilliant for storage.. very important to save all the space you can if you’re going to be working in that environment. Please continue to share such excellent content! Amazing quality photos too! nice design…i want to practice that and can you make tutorial about tha? When I originally left a comment I appear to have clicked the -Notify me when new comments are added- checkbox and now whenever a comment is added I recieve 4 emails with the exact same comment. So inspiring and impressive. The more time I spend on your site, the more amazed I am. Thanks, Diane, I needed this today! Hi Diane, First off, I LOVE that you show the messy parts and not just the perfect end moment. Makes me feel way better! Second, I NEED to know how to make that pencil crayon carousel! Can you dig up the directions or at least give me some basics. My son is very artistic and we are forever trying to manage the pencil crayons. Hubby is handy so even if you can at least point me in the right direction, it would be great! Hi Susan – Here is the link to the post where I give more details on the pencil carousel. I need to link it in my post. Oh, love these ideas! Where can I get the beaded trim you added to the bottom of the shelves/dressers? I am redoing my bedroom furniture and that would be a great feature to make them look just a little different than what they are now. hey, love the post! what did you use to repaint stuff to white? what process? I went over the surface of the furniture with a sander to rough up the surface a bit and cleaned the grit off with a tack cloth.I did not take it down to the bare wood, just sanded enough to remove the shine on the finish. I used two light coats of Kilz Original primer. It is oil based but dries in 30 minutes. Roll on two light coats on the flat surfaces with a high quality sponge style roller and use a 1-2″ angled brush on the beveled edges. Let the first coat dry before applying the second. Once the primer is dry roll on 2 light coats of latex semi-gloss paint. Use the angles brush on the beveled edges. Let the first coat dry before applying the second. That is it – it is the method I use to paint all furniture. On some pieces where stain bleeding through is not going to be an issue I use Glidden Gripping Primer. I used that on my kitchen cabinets over 10 years ago and they still look great. Your blog in now in my top ten; I love all your ideas which have inspired me to make some great changes in my craft area and home. Thank you so much! I look forward to more posts. Thank you so much for sharing !!!!! You make everything sound so easy to do and looks great! This is my favorite room. I spend most of my time in the room. Right now it is undergoing a makeover- not huge, just new paint and switching things around. It is a mess right now, but I am enjoying the process. I totally understand “favorite room” as that is how I fill about my work room :) can’t wait to see the results and the lovely way you put it on your posts! Your ideas are all SO WONDERFUL! I “pin”-ed 2 of the pics on my Pintrest DIY board (http://pinterest.com/farrangel/diy-to-die-for/) so others can find you there, too. Thanks for sharing all of this! I just saw your studioffice and your jaw-droppingly organized armoire!!!!!! Just love it. I’m a few months away from having my own studio/sewing room and the storage is crucial. Wonderful ideas. Thanks. I found your office by way of your decoupage dresser. I’m in the process of taking an antique vanity I found at a resale shop (the wooden laminate top is flaking off) and turning it into my writing desk for the office side of my bedroom (has to be a multi-purpose space). I’ve never decoupaged before, and am planning to do the surface of the vanity/desk and then pour an epoxy resin over the top to give an exceptionally smooth and durable finish. But your office space is AMAZING!!! I wish I had the finds you’ve had to convert! What an inspiration as I try to finish setting up my dual-purpose bedroom. This whole room is awesome. You are so inspirational. 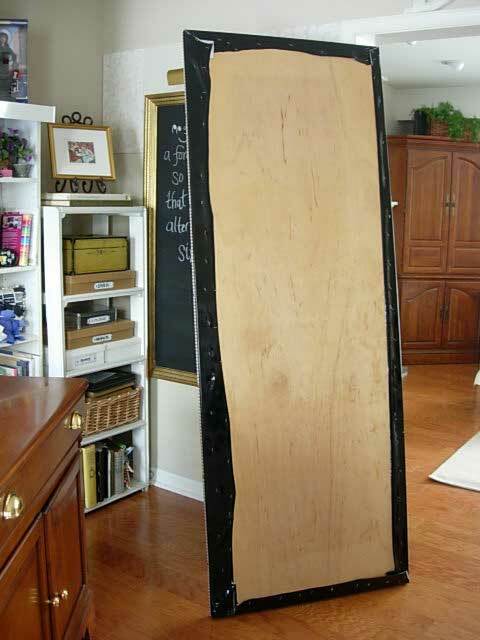 I will be bookmarking all of the projects, definitely the foam board inspiration wall and the cabinet. Thanks Julie It took some trial and error to get it the way I wanted, but I love this room now. It is my favorite room in my house. I am in crafting room envy. I wish I knew how to bookmark you and come back and dream. I need that workbench! and the armoire! and the chair cover, lol…….you are a great inspiration! I am in love with your amoire, it’s not often that I get jealous but I must admit to a little pang while looking at your crafting space, it’s beautiful and something that I’ll keep in mind as my own space evolves and develops, so many great ideas! Love it all! The work table transformation is superb!! I love that it can serve as a buffet when needed. I completely adore the chalkboard and inspiration board, too!! I’m so glad you linked up to Workspace Showcase! I am so impressed with your super organized office space. There is no one else in the WORLD who could use their work table as a buffet!!! You are amazing! I too love the interior of your armoire. OMG. Completely a delight of organizational excellence to behold. I could stay in here all day and just admire your clever labeling skills, really! YOU need to have your own show on TLC. So thrilled to find your blog tonight! I will follow and I hope you will lead me to be more organized like you. May I ask you how big your studio room is. You really were able to fit alot of furniture in it. Would you be able to look at a picture of my room and the pieces I have and give me ideas that I could use what I have? Thanks so much for sharing your space on the Bella B Designs Inspire Me With YOUR Creative Space Blog Hop/Link Party! Your creative space is amazing and I have GOT to try and recover my chair like you did. I have one JUST like yours! I also love how you re-purposed your cabinets! What a beautiful and inspirational space! Thank you for sharing! A gorgeous room that seems to be indicative of your personality and multifunctional to boot. Well done! The transformation of those two cabinets is stunning. And to think you can turn it into a buffet at night, if you choose! I love the armoire, too. When open, it is very colorful. You have a delightful studio, full of lovely and interesting storage solutions. The sewing machine hides away well, I must say. I really enjoyed my visit, even though I’m running really behind. Its getting late but I will be here everyday to visit , you are so creative !!! I love how you have carefully thought out your space to make it multi-functional. You’ve done a great job! Wish I could come and visit in person so I could get some more hints for my own studio re-do. Thanks for the visit. WOW!!! I just love your beautiful creative space. I am just now making it to the “I’s” on my WBC journey. LOL…Thanks for sharing. Hi Debby – You are ahead of me. I am trying to get to a few a day. I am so glad she is going to leave the site up so we can find inspiration all year long. Just love this space. I want one of my own! I love the before and after photos on your studio storage solutions, especially the two cabinets with the long counter top! Thank you for sharing your creative haven. great job.. love the white! Love, love, love it!!! My creative space is in a large bonus room, but it is nowhere near as cute as yours! I’m so envious! Incredible ideas for organizing and making your space just a little more pretty. Love the armoire. love your space! and all the revamping you’ve done to the furniture~will be back once i’ve seen allllll the other spaces! Oooh la la. I love everything about your craft room. I am swooning over you armoire and the organization of the inside of it. I wish I had a room, and handy places for all my creative-mess! Be still my heart!!! 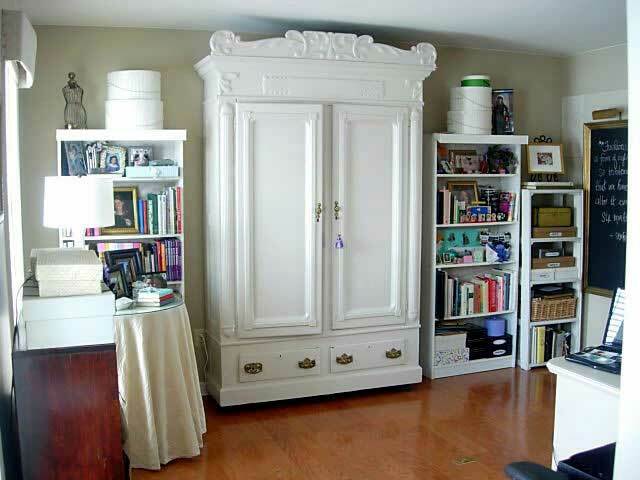 That armoire is the most amazing storage space ever! And I love what you did to the oak dressers. They look perfect. Thank you so much for sharing your wonderful space with all of us! Thanks so much for having this fun and inspiring tour of bloggers creative spaces. I have only gotten to a few dozen so far and can’t wait until I can spend some time visiting all of them. Fantastic storage….wow! A very classy creative space to do all of your creating in. Love how you re-puropse things too. I saw the other post on trash to treasure. Thanks so much for sharing it all with us. LOVE all the DIY details! Thank you for sharing. OH wow! This room is the stuff my dreams are made of. I do believe, we are indeed kindred spirits. :) Thanks for stopping by! I just added you to my reader too. Okay, you impress the heck out of me! I am in awe of your creativity and ingenuity! The work table and armoire are amazing! I have signed up to follow your blog. I can’t wait to see more of your creative ideas! Thanks for the peek into your studio and into your life! When you have time, please stop by my blog for a visit! Love the way you’ve repurposed different pieces of furniture. Love you pencil holder. I will be back after the party-to check out more of your blog! I love the furniture you have transformed. They look SO GOOD! You really have talent. thanks for sharing. What a wonderful space! 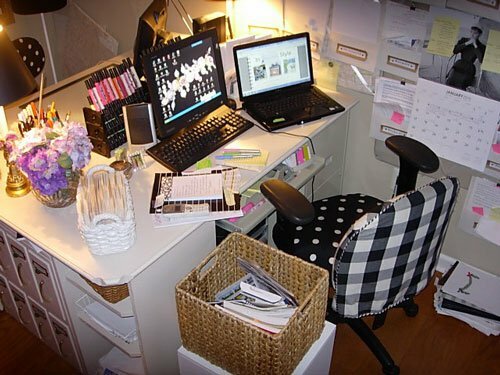 So many wonderful things, the partners desk, the work table and that Armoire – I am drooling! Love that song from Willy Wonka – it is one of my favorites. It looks AMAZING! What a transformation! Wish I could move in and work beside you every day! 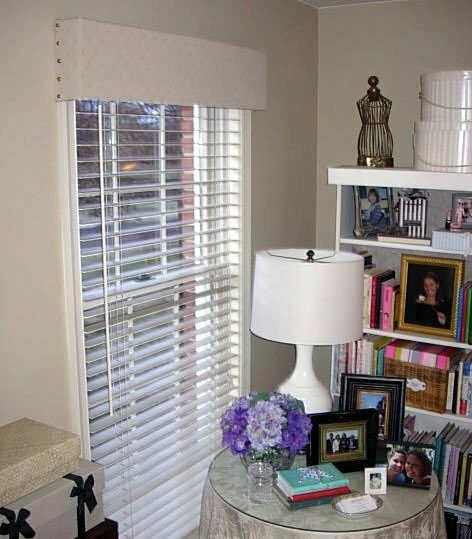 Love the skirted table and the newly white shelves with the pretty box boxes. The whole space makes me go weak in the knees! We have such similar taste to be sure—this is absolutely lovely Diane! Oh my gosh.. you got me at the craft cabinet. What a magnificent piece! And what’s inside is equally impressive. What a lovely setup you have! What an AMAZING hutch!! I love it! 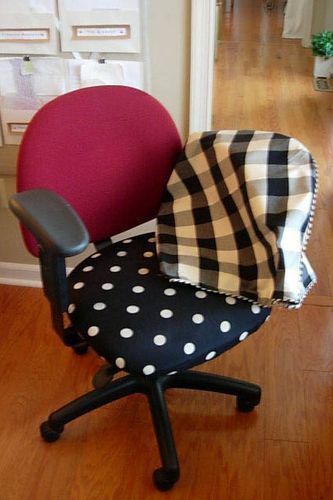 And your slip covers on your chair are darling too! Great job! It’s just magnificent, sugar. I love what you’ve done in painting it white also. Clean, crisp with black and white chair makes it all just divine. What a great space! Love it! Wow! 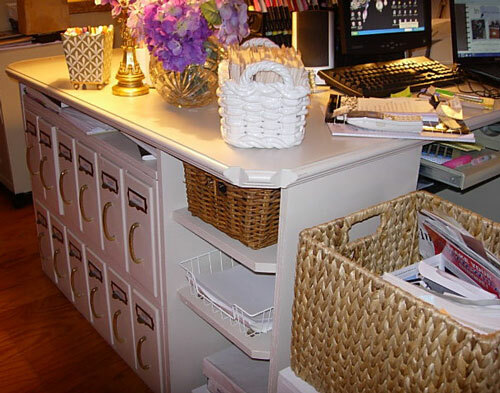 Lots of great ideas for organizing your space. it is like a DIY magazine! :) Thanks for sharing and I hope you don’t mind if I take some of your ideas for my studio especially the colored pencils wheel. Would make my life so much easier. If I can find the directions, my dad may still have them – I will post them for anyone who needs some step by step help. Thanks so much for the tour and how-to’s from your creative space, I especially loved the office chair cover. 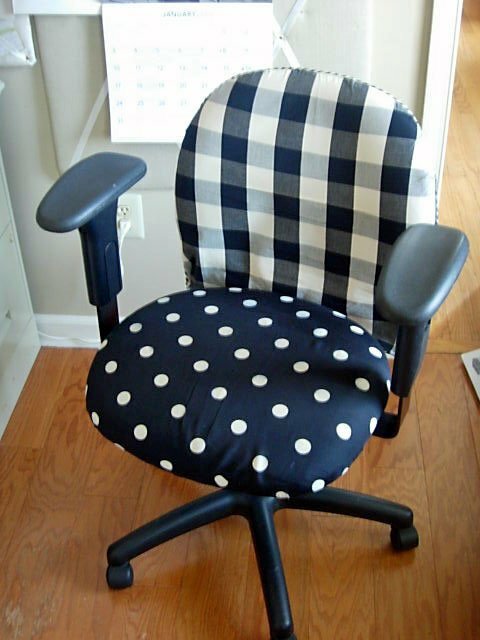 I have a chair very much like yours that I’ve been planning on slip covering, so I’m inspired to get that project done now! Thanks! How wonderfully inventive and organized. Thanks for the inspiration! Great room you have. That armoire set up is simply wonderful. My stuff has taken over every room. We hope to make a space in a second building we have currently crammed with all things we had to have yet have not put to use. Thanks for stopping by my blog and leaving a comment on the glamorous beach vase. What a perfect space! It’s organized, clever, thrifty, and GORGEOUS! I am completely intoxicated. Will definitely bookmark this and study it with a magnifying glass later. Oh my. Such a beautiful post and studio. This is my fist time to visit you and expect to come back many more times. If you ever think you might be interested — join in our meme on Fridays as we celebrate the beauty in our lives. You would fit in perfectly! Great space! Loving all the white and the alterations you made! A beautiful space…you can see your eye for design and your creativity. Wish I were as organized too. It is a great feeling to get organized, but so hard to stay organized. I find I go thru times when I have stuff piled high. I try to have Spring and Fall organizing days so my “stuff” doesn’t take over. Thanks for the nice comment.